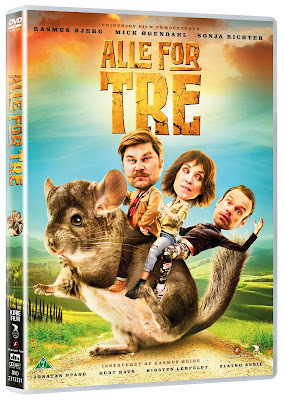 The 2017 Danish comedy Alle for Tre (All for Three in English) joins two prior films, Alle for én (All for One) and Alle for to (All for Two), in portraying the petty criminal activities of dim-witted brothers Timo (Rasmus Bjerg) and Ralf (Mick Øgendahl). It is revealed in the opening scene that Timo is in trouble for back child support. He promises his ex-wife that he will pay off his debt with money he expects to receive from his recently deceased father's will. Timo sits anxiously with Ralf as he listens to the reading of the will. The executor explains that their father's only worldly possession was a rare vintage motorbike, which he left to his firstborn child. Timo is pleased to hear this. He resolves to sell the motorbike for maximum profit to a collector. But he isn't, as he thought, his father's firstborn. The brothers have an older half-sister their father never told them about. Timo is enraged by the news. He arranges with Ralf to travel to their half-sister's home in Tuscany to steal the motorbike, which he insists is his rightful property. Their half-sister, Kim (Sonja Richter), turns out to be an eccentric anti-fur activist whose life is devoted to setting off paint bombs in fur stores. Ralf secretly follows Kim into a fur store only to get caught in the blast of her latest paint bomb. Ralf later tries on his new inflatable suit, unaware that Kim is nearby planting a bomb at a fur plant. When the bomb ignites, Ralf does his best to get away. It's a silly little film, but it's alright for a comedy to be silly. The Danish Film Institute reported that Alle for Tre was the most successful Danish film of 2017. Alle for Tre has been marketed in some territories under the title Three Heists and a Hamster.